The quintessence of the Buddhadharma is to bring happiness and its causes to all sentient beings and to eliminate suffering and its causes from everyone. Since all human beings long for well-being, a state free of frustration and pain, I think that every spiritual tradition in the world teaches this same goal. All spiritual aims are therefore identical in their goal, but due to the various mental inclinations and propensities of every living being, the means to bring about well-being vary and differ. On the spiritual path of Buddhism, a practitioner also strives to become free of suffering and to attain peace and happiness. There are different kinds of happiness, relative and ultimate. Relative happiness might seem to be happiness, but this is not the case. Relative happiness turns into suffering when things inevitably change or are lost. Since the nature of transitory happiness is suffering, beings go through tremendous frustration and experience much discontent - which brings more intense suffering and pain - while striving to achieve their aim. There is much turmoil in the world – wars, conflicts, and natural catastrophes. We all want to be free of such experiences and think that peace, well-being, and happiness depend on circumstances and conditions that need to be created or acquired outside our present situation. We continuously do what we can to satisfy our desire to have happiness in the world. Since all things change into the suffering of loss, we cannot really experience genuine joy. Because all compounded things are subject to destruction and decay, any well-being created and experienced anew stands on shaky ground. The Buddha taught that lasting and genuine peace and happiness can only be found by turning our attention inwards. The true nature of living beings, which is happiness and contentment, is inherent to all beings without exception and since time without a beginning. It won’t be possible to be truly happy and content until we have realized our true nature. When we have realized our true nature, we will experience the richness and fullness of our being. For example, if one were to acquire somebody else’s mine of jewels after having taken their land and property from them, one wouldn’t be content because one would be fearful of losing the fortune and even losing one’s life. On the other hand, should one legally possess a mine of treasures, one would be free to use it as one wants after having dug it out. Likewise, peace or gentleness that are one’s true nature become very meaningful when discovered and cultivated. But, as it is, everything compounded, created, or acquired is subject to the suffering of change and loss. To experience lasting peace and joy, Lord Buddha taught that we need to turn our attention inwards and pacify and tame our present state of mental upheaval. If we don’t tame and train our mind, world peace will not be. True peace is the fundamental quality of the mind, which can be experienced through the mediation practices of skilful means. Meditation practice enables us to experience our mind, which is by nature open, gentle, and peaceful. Every living being possesses the Buddha nature, i.e., basic goodness, and therefore every living being has the potential to experience absolute, indestructible happiness of the awakened mind that is free of suffering and pain. Since everyone has basic goodness, there’s no difference between any one, regardless of race, nationality, or creed. The Buddha taught that personal experiences are vital in realizing our inherent, true nature and that we need to turn our attention on our mind to discover our own richness and fullness of being. Erroneous concepts about outer propositions are created due to bewilderment or a state of confusion. It is evident that whatever is compounded is subject to destruction, separation, and loss. It is logical that external objects are created and compounded and therefore can never render lasting happiness and joy. In short, we seek happiness and freedom from suffering and pain. In order to experience genuine happiness, though, we need to pacify and tame our mind so that its natural gentleness and openness manifest freely and clearly. Freedom from suffering and discontent can never be if the mind is not tamed and trained. Believing so, we only create self-imposed problems that we inevitably face and have to deal with. We need to work on our mind, otherwise we will continue experiencing the great variety of manifestations of our own delusion, which, like a sharp weapon, hits and pierces us deeply. How does this happen? Our mind spreads outwards and our emotional reactions determine ensuing experiences. We fail to realize that we ourselves create and are responsible for our experiences and think that painful experiences unjustly arise from external causes and due to outer conditions. This is not the case. We need to acknowledge that all appearances and experiences are a projection of our own mind and for this reason we know that we need to refine our mind. What is Buddhism? Learning to know ourselves as we are, learning to recognize our innate nature that encompasses qualities of value. Buddhism isn’t a custom restricted to a specific region or territory. It is knowledge and, based on common sense, means learning to truly know ourselves. Buddhism teaches that – unless we integrate the teachings that Lord Buddha presented in all we are and do - it is foolish to boast about having embarked on the journey to spiritual refinement and peace. Rinpoche: I feel that there is an obvious relationship between Buddhism and Christianity and among all spiritual traditions and peoples. All sentient beings are endowed with the Buddha nature and consequently the potential to experience enlightenment. Christ had the Buddha nature and, to a certain degree, had realized it. All beings are fundamentally the same; they aren’t identical, though. Everyone possesses the same essence as the Buddhas. In Buddhism, we learn to look at the Buddha, which is our mind’s true nature. Relatively, Buddha is outside, for example, as Shakyamuni Buddha. Another explanation describes it as a mine under one’s own property. If you dig out the treasure and make use of it, you experience tremendous benefits. It would be useless leaving the mine untouched. So, “treasure mine” means utilizing our own resources. Rinpoche: This is a very meaningful question. We are obscured due to clinging to duality, which obstructs us from recognizing the treasure mine within. We have the habit of clinging to a subject and object as distinct. This habit impedes us from seeing the treasure within, which is our mind’s true nature. By clinging to duality as real, we deprive ourselves of experiencing our true nature. This long-standing habit cannot immediately be unravelled, therefore our mind’s true nature cannot immediately be seen. Obscurations are habits that need to be unravelled through the gradual and consistent practice of meditation. Through this goodness may omniscience be attained and thereby may every enemy (mental defilement) be overcome. May beings be liberated from the ocean of samsara that is troubled by waves of birth, old age, sickness, and death. By this virtue may I quickly attain the state of Guru Buddha and then lead every being without exception to that very state. May precious and supreme Bodhicitta that has not been generated now be so, and may precious Bodhicitta that has already been never decline but continuously increase. May the life of the Glorious Lama remain steadfast and firm. May peace and happiness fully arise for beings as limitless in number as space is vast in its extent. Having accumulated merit and purified negativities, may I and all living beings without exception swiftly establish the levels and grounds of Buddhahood. 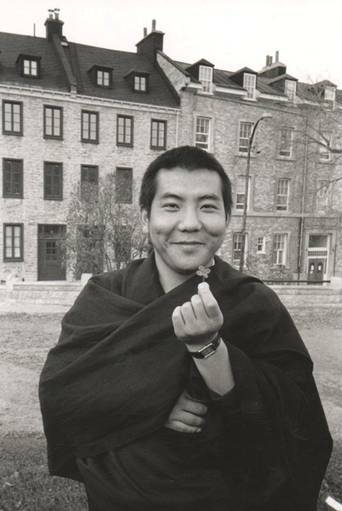 The Photo of Jamgon Kongtrul Rinpoche the Third was taken in Quebec, Canada. The photo of the butter lamp offerings at Pullahari Monastery, Nepal, was taken in 2011 by Dechen Chen from Taichung, Taiwan, and kindly offered here. The teachings were presented in 1985 at The Milarepa Dharma Center in Montreal, Canada, and were simultaneously translated from Tibetan into English by Ngödrub Burkhar; they were transcribed in 1989 and typed and edited again in 2011 by Gaby Hollmann, who is responsible for any mistakes. Copyright Jamgon Kongtrul Labrang at the Great Monastery of Pullahari in Nepal, 2011. All rights reserved.